"Can Windows Media Player play Blu-ray discs? – I just installed Windows 7 premium home,full retail 64 bit version. I was surprised to find that I can’t play Blu-ray on Windows Media Player. What is Microsoft doing to solve the Windows Media Player Blu-ray playback issue? BluRay has been around for a long time and I’m sure thousands of Windows 7 customers are going to be in the same boat as me. There are NO codec available through a Google search ( 64 bit) and I would be very reluctant to use one off the internet anyway (Virus issues)." It’s not a fresh topic. Windows 7/8 Media Player no longer has the support of DVD playback, not even to say playing Blu-ray on Windows Media Player. To play Blu-ray on Windows computer, currently there are 3 different ways: use Windows Media Player Blu-ray codec, turn to 3rd-party Blu-ray player software, and rip Blu-ray to Windows Media Player compatible videos. This guide will introduce you these 3 ways to play Blu-ray on Windows Media Player in details. Due to Sony’s licensing policy upon Blu-ray, Windows Media Player Blu-ray compatible issue has not solved in the latest Windows OS version. If Windows users plan to play Blu-ray on Windows Media Player, they will have no direct support from Microsoft, but turn to some extra assistance. Making use of Blu-ray plugin for Windows Media Player is a primary solution to solve the Windows Media Player Blu-ray incompatibile issue. 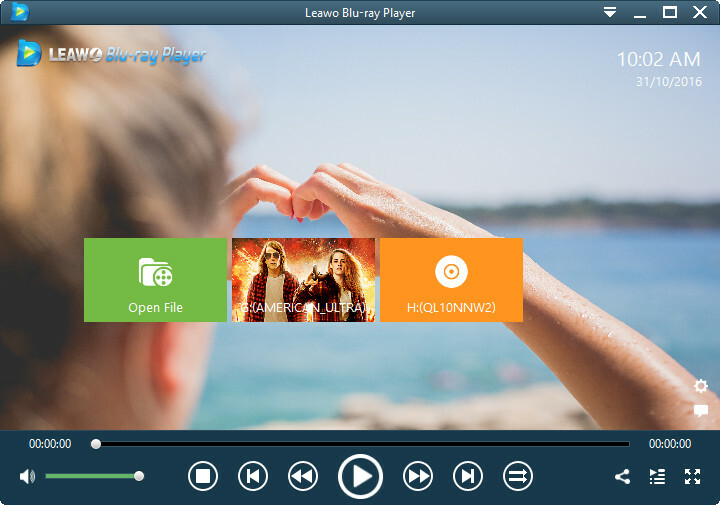 A Blu-ray plugin for Windows Media Player will help Windows users play Blu-ray on Windows Media Player – the system’s default media player. Windows Media Player Blu-ray codec, aka Blu-ray plugin for Windows Media Player, is a piece of software capable of encoding and/or decoding video and/or audio data from files, streams and broadcasts. The word Codec is a portmanteau of ‘compressor-decompressor’. Quite a few Windows Media Player Blu-ray codec packs are available for downloading and installing, like Windows Media Codec Pack or Media Player Codec Pack, The mediaplayercodecpack.com website offers a popular codec pack for Windows media player that includes a number of popular codecs, including support for Blu-ray, which will allow you to play Blu-ray with Windows media player. You can download the codec pack on CNET’s website or you can go directly to its website for downloading. If you have no desire to download and install Blu-ray plugin for Windows Media Player, why not try a piece of alternative to Windows Media Player to play Blu-ray on Windows successfully? The Free Blu-ray Player for Windows from Leawo is your perfect choice. It includes region free Blu-ray player software, free DVD player software and free HD media player into perfect combination, allowing you to play back Blu-ray/DVD disc, common videos and up to 1080p HD videos smoothly on Windows PC. The newest Blu-ray and DVD discs released in the market can be played back as well. Leawo Free Blu-ray Player software also comes with advanced audio decoding technologies like Dolby, DTS, AAC, TrueHD, DTS-HD, etc. delivering extraordinary audio effect. Blu-ray recorder drive, either external or internal. Download free Blu-ray player and set it up on your Windows computer. Insert Blu-ray movie disc into the Blu-ray recorder drive. Open this free Blu-ray player software. This free Blu-ray player software would then automatically detect your disc drive and display detected disc on the main interface. Click the disc name on the main interface. This free Blu-ray player software would start to play Blu-ray movies. You could control the Blu-ray playback via remote controller to select what to play: main movie, certain scene, bonus features, etc. Besides using Windows Media Player Blu-ray codec and free Blu-ray player to Windows Media Player, is there any other solution to help play Blu-ray on Windows Media Player? Of course yes. That’s to rip Blu-ray to Windows Media Player compaitilbe videos, so you could then play ripped Blu-ray movies with Windows Media Player smoothly. 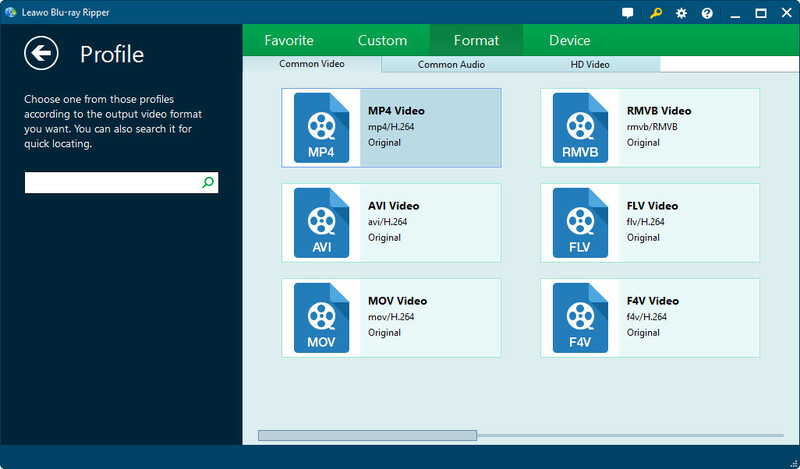 We all know that Windows Media Player accepts videos in WMV, MP4 and other formats. Therefore, to play Blu-ray on Windows Media Player, why not try to rip and convert Blu-ray to MP4/WMV video files? Insert source Blu-ray movie disc into the Blu-ray recorder drive. Download and install Leawo Blu-ray Ripper – a professional Windows Blu-ray ripping software app that could decrypt, rip and convert Blu-ray to MP4, WMV, AVI, FLV, MOV, etc. for Windows Media Player, iPad, Android devices, etc. Make sure of good internet connection. Get enough hard drive space. Click the "Add Blu-ray/DVD" button on the main interface to load Blu-ray disc into this Blu-ray ripper software from your Blu-ray drive. Click the drop-down box next to the "Add Blu-ray/DVD" button and then select "Change" option to set output format. Since you need to play Blu-ray in Windows Media Player, select either MP4 or WMV as output format from the "Format > Common Video" tab. Finally, click the bottom "Convert" button on the sidebar. This Blu-ray Ripper would start to convert Blu-ray to Windows Media Player videos immediately. After conversion, you could view converted Blu-ray files in target folder you’ve set in Step 3. The first 2 methods would help you directly play Blu-ray on Windows Media Player. The method 3 seems to be much troublesome. However, it’s more useful if you not only want to play Blu-ray on Windows Media Player, but edit it in video editing software, uploading Blu-ray to blog or playing Blu-ray on portable devices like iPad. Does this post answer well to your question like "can Windows Media Player play Blu-ray"?